Occasionally in this space, we take a look at the cold storage stock numbers provided each month by the United States Department of Agriculture’s National Agriculture Statistics Service. But this month, we thought it would be interesting to get a slightly different take, in video form, from Michael Nepveux, an economist with the American Farm Bureau Foundation. Nepveux, who recently joined AFBF after serving as a policy and and economic research consultant with Informa Economics’ Agribusiness Consulting Group, sat down a couple days ago with host Christian Loren on RFD-TV to share what stood out to him with the USDA’s most recent cold storage numbers. Highlights included the 4 percent year-over-year growth in total refrigerated and frozen stock as well as the growth in animal parts not typically popular with Americans, such as pork bellies and chicken feet. He did not say if the increase in stock for products typically exported overseas were driven by retaliatory tariffs by countries like China, Mexico and others responding to the Trump Administration’s tariff increases on imports, but he did say that “over the past three months we have seen the largest amount of chicken feet in cold storage.” Chicken feet are a popular ingredient in many types of cuisine across China, Indonesia, Korea, Mexico and other countries. Loren: USDA’s cold storage report came out on Monday. It shows all commodities in cold storage are up by 4 percent from last year. Joining us now for a further look at the report is AFBF Economist Michael Nepveux. Thanks so much for joining us, Michael. For those who are unfamiliar, give us an overview of the report and its significance. 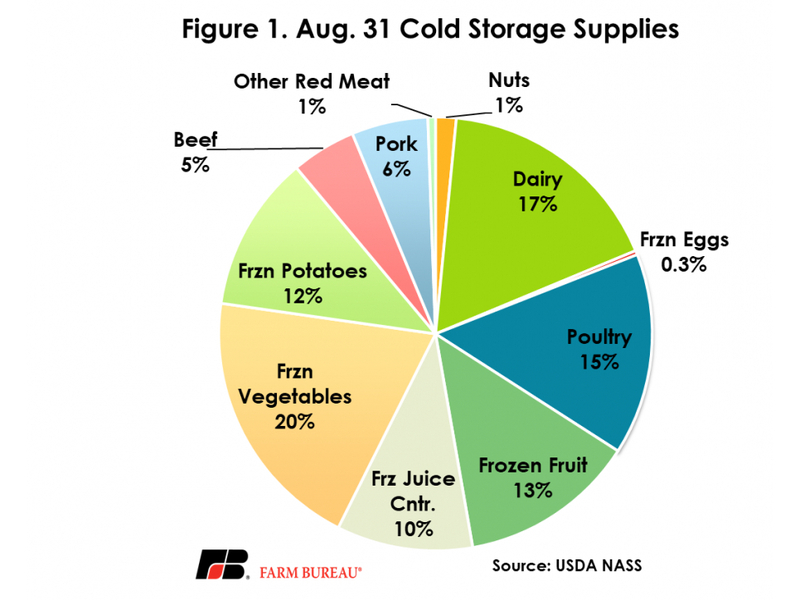 Nepveux: OK, so like you mentioned, on Monday, the USDA released the latest cold storage report. Now what this report is is it shows how much commodities have been growing in coolers and freezers throughout the United States. What this report does is it allows us to see, you know, how much these commodities are piling up in stocks and gives us a good idea on what demand has been. Loren: OK, so are there any particular products that stand out to you based on this most recent report? Nepveux: Yes, there’s actually quite a few. So one is pork bellies. Pork bellies have been piling up in cold storage. We’re actually looking at almost twice as many pork bellies as we had last year. Another one is chicken paws and chicken feet. As you would imagine, that’s not exactly something we eat as much here in the United States. So because of cultural preferences, there are parts of the bird that we tend to send to other countries while we eat things like white breast meat and we send things like dark meat away. So that’s one where over the past three months we have seen the largest amount of chicken feet in cold storage. Loren: Where are you seeing this concentrated in the country? Nepveux: So, as you can imagine, where this capacity tends to store up is in areas where we produce commodities that need to be frozen and cooled down. So California, Washington, Texas, Florida and Wisconsin — those are the top five states, and they actually account for around 40 percent of the useable cold storage capacity in the United States. Loren: OK, we always appreciate your comprehensive updates. AFBF Economist Michael Nepveux, thank you so much for joining us.